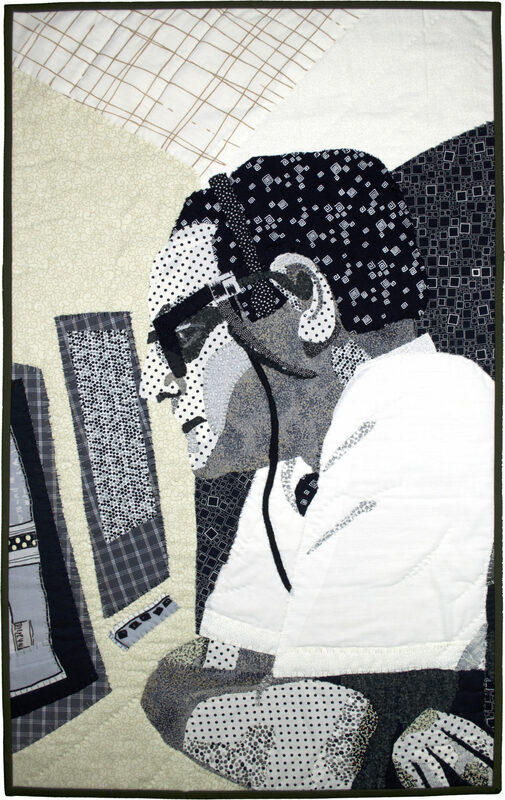 This quilt shows one of the highly important, but low-profile people who supported the Apollo moon missions. We don’t know their names, like we do the astronauts, but space explorations could never have succeeded without their input. Their contributions are vital and appreciated. From the NASA website, here are a few of the many job roles and responsibilities of the Mission Control team: Flight operations; Takeoff and landing; Communications; Navigation; Data; Health/Medical; Scientists; Propulsion engineers; Training; Troubleshooting; Payload specialists; Crew activities; Vehicle control; Electrical engineers; Instrumentation; Maintenance; Public relations; Structural mechanical systems. We owe a debt of gratitude for the minds, hearts, hands, and gray hairs of those who labored behind the scenes on the Apollo missions. Raw edge hand applique, hand quilted. Commercial and upcycled thrift store clothing fabrics, embroidery threads.